Where does one draw the line between sharing one’s own experiences with particular Godly lifestyle choices and simply making excuses for one’s own decisions? 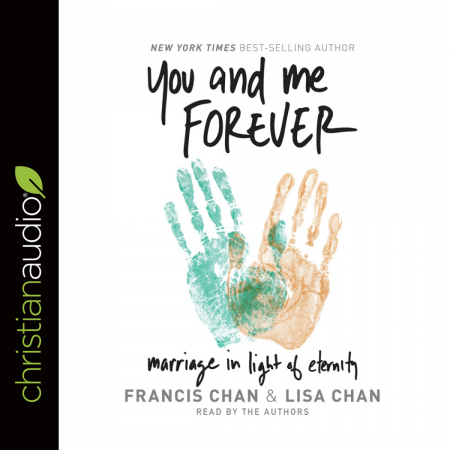 That’s the question I kept asking myself as I listened to the audiobook edition of You and Me Forever: Marriage in Light of Eternity by Francis & Lisa Chan. Don’t get me wrong: I agree with the basic premise of this book (that the way to have a great marriage is to put God first before even your marriage) and am happy to see the Chans write a book promoting this premise. And the great news is that this message does come across throughout the book. Unfortunately, it is mired in personal anecdotes that kept bringing me back to that question. Case in point: Francis says that he frequently travels and is away from his family. His children understand that he has to put God first and, therefore, might not always be there when they want him. While that sounds great, I would be willing to bet that he has a neighbor who is similarly not there when his children want him, but his excuse is that his work pays for their lifestyle. It’s just two excuses for the exact same result. Again, I’m not saying this book is awful. There’s truth to be found. For example, Lisa says that she leads a Bible study on being a Godly wife. After many years, she has come to realize that we focus too much on “Godly wife” and “Godly husband” and that if we focused more on “Godly” we wouldn’t need the rest of it. I think that’s a great point and it’s not the only one in the book. Also, Francis and Lisa do use scripture throughout the book. So, should you bother to listen to or read this book? Maybe. I still think it’s a great premise, but, honestly, the book has caused me to question that premise. The narration is excellent. The book is read by the authors and they did a phenomenal job. Oh, by the way, the summary of the book leads one to believe that this book is beneficial to singles as well. Here’s how that works: you need to get married today so that you can enjoy the wife/husband of your youth by focusing on God rather than your spouse. Personally, I believe that God gives us all singleness for a time for a purpose, just as he gives some people marriage for a time for a purpose. While single, we must focus on God’s purpose for our singleness. If we marry, then we must focus on God’s purpose for our marriage. The Chans are stuck in the common Christian attitude that marriage is absolutely God’s plan for us all, which has lead so many people to ignore God’s call for their lives.